Is your cat sleeping in your bed with you? I’ve experienced all sides of sleeping with cats. When I was single, I had cats. They got to share the bed and it was no big deal. They loved it, and it made me happy to see them happy. But things changed a little when two humans started sleeping in the bed. We let the cats join us at first, but with a full-size bed — and cats who either didn’t move at all or moved in ways to wake us up — we discovered that the quality of our sleep had gone down the drain. I love my sleep, and I was forced to reconsider the issues of cats sleeping in the bed. Recently, I met a nice woman who does a lot of work in foster and cat rescue, and she seemed surprised that I shut the cats out of the bedroom. But I’ve learned that I really don’t function that well without good sleep. And how can I take care of my cats if I’m not functioning at my best? See — it always comes back to the cats. 1. Are you getting any sleep with cats on your bed? 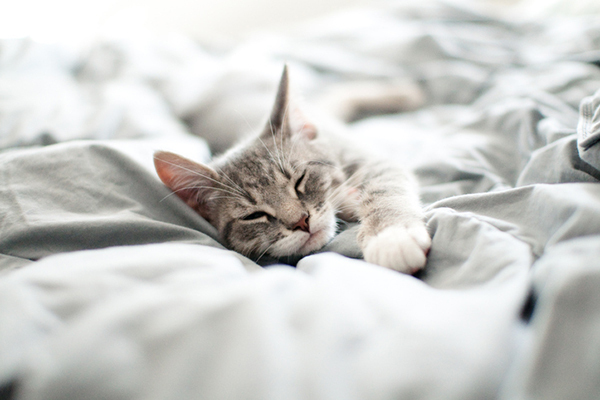 A gray kitten asleep in a bed. Photography by hamacle/Thinkstock. Is having the cat or cats on the bed worth sacrificing a full night of sleep? Only you can answer that! Some fortunate people need little or no sleep. I envy these people. Oh, the stuff I could get done if I didn’t need eight hours of sleep time. 2. Does sleeping with cats interrupt your sleep? Is your lovely, deep, REM sleep interrupted suddenly when your sleeping cat decides to jump on your face? Does the tender pat pat or scratch scratch of a gentle paw wake you up earlier than usual? But more important, does this bother you? If not, great! If I could go without sleep, I would surely and generously share the bed with my cats. 3. Are the cats happy sleeping in your bed? If sleep doesn’t matter, or if you sleep so deeply that no cat could wake you up, consider whether bedtime privileges make your cat deliriously happy and add to his quality of life. Maybe that sounds over the top, but honestly, I’ve had cats that light up for hours after getting coveted time on the bed with us. Note that in our household, bedtime with people in the bed seems to be much more special than time napping on a bed devoid of humans. 4. Does one cat need special attention? I have used the bed, on occasion, to give a cat needed attention in certain situations. For example, if one cat is really tired out with the arrival of a new kitten, I might give that adult cat a break from the kitten by allowing the adult some night time bed time, even if I know that adult (a certain black cat comes to mind) is going to get very lovey at about four in the morning with the intention to wake me up. When my buff cat Chester was grieving the loss of his buddy, I gave Chester lots of bed time. He needed the extra attention. I’m not completely rigid about keeping cats out of the bed when we are sleeping! 5. Do your cats turn into concrete bricks on the bed? How does one small cat turn into a concrete brick? It’s one of the magic tricks that cats pull. If you cannot sleep because you run into a feline brick every time you toss and turn, well, the cat might have to get off the bed. Some cats have also perfected the art of being fluid concrete bricks, as they drape themselves over your sleeping body and refuse to move. 6. Do the cats make a fuss at the closed bedroom door, making more noise than they would on the bed? If you have clever cats who have figured out how to make noise on the other side of the bedroom door, letting the cats on the bed might be the lesser of two evils. You decide! 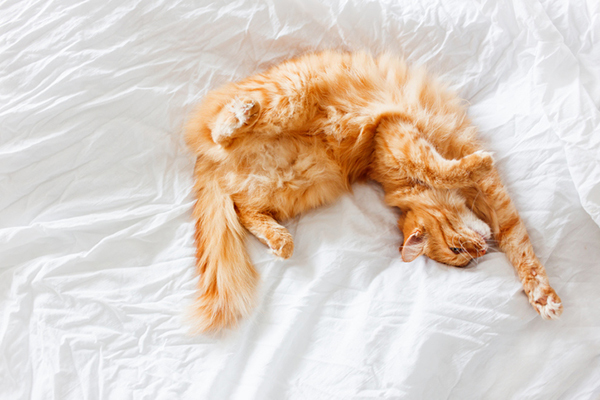 Tell us: What do you think about sleeping with cats? Do you sleep with your cats? Does it make the quality of your sleep better or worse, or does it matter? Does your cat love bedtime privileges? Share your stories in comments! My cat Baby waits every night for me to go to sleep,then she hops up on the edge of the bed,then my other cat couger looks and gently pokes baby to make sure she’s sleeping and lays down next to her.sometimes Baby likes her sleeping next to her and other times baby jumps up and sleeps on the chair next to the bed.Baby gets jealous.they definitely have their bedtime ritual. I had a cat that I raised from kittenhood on, and I let her sleep with me. When she was about 3 years old, she decided that simply sleeping in the same bed with me wasn’t good enough. She slept ON me. Not only that, when I turned over, she walked over with me and then settled back in. On my back, stomach, side, you name it. There she was! It seems my cat Meow and I have a ritual although people tell me I’m deluded! When bedtime nears (or the time Meow is accustomed to me going to bed) and I’m still on my laptop in the office, Meow will appear and start yawning as if she’s signaling “it’s bedtime”! Of course, I obey and promptly close the laptop and go hunker down with her. Although she does hog the bedspace at times, I can’t imagine not sleeping with Meow. She is a source of comfort to me!